If you are looking to get a visa arranged to go to China and you are based in Thailand then we can help with this process from beginning to end and get a visa sorted for you within 4 days from start to finish. We offer completely free consultations and we can are available 7 days a week to talk to for enquiries. Our price for a Chinese visa is 4,500 baht for a Thai citizen and 6,000 baht for a foreigner and this is fully inclusive. The price difference here is due to the added paperwork that is involved in the process of making the visa. If you would like to go ahead with our visa to China from Thailand service please use one of our contact forms to get in touch. We accept payments by either bank transfer or cash. 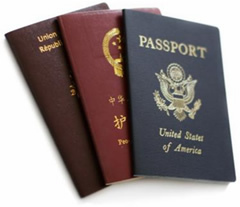 We look forward to helping you obtain your visa to China! Portrait of an attractive multicultural couple.